JOHN WESLEY BIBLE, age 62 departed this life on June 23, 2018. Johnny is survived by his mother, Kathryne Bible, sisters, Kathy Bible Combs (Steve), and Libby Bible Jaynes (Joe), sister-in-law, Patricia Bible, and former wife, Lisa Catron. 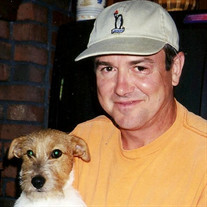 Johnny is also survived by a grieving "Lemmiwinks", Johnny's constant companion Jack Russell. Johnny was pre-deceased by his father, John T. Bible, along with brothers, Tim and Chris Bible, and brother-in law, Buddy Cole. Johnny leaves behind a host of nieces, nephews, aunts, uncles, and cousins. A long-time lake and water sport enthusiast, Johnny had been a member of the Cedar Hill Boat Dock community since its beginning. At one time... Johnny was considered "the best skier on Cherokee Lake". Johnny was a friend to and of many. His other interests included scuba diving and motor bike racing. Johnny was an Independent Sales Representative of commercial stairs and ladders. Additionally, he was a commercial diver who installed, anchored, and maintained many docks in the area. A time of celebration of Johnny's life will be held on the lake and announced later. Memorial gifts may be made to The ALS Association of Tennessee; P.O. Box 40144; Nashville, TN 37204. The family would like to express gratitude to Katrina Kepf, RN and Care Service Coordinator.